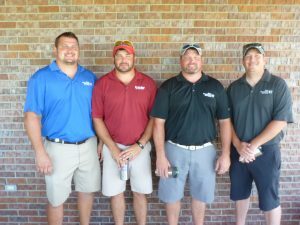 The 13th Annual Foundation for Blue Valley Lutheran Homes Golf Tournament was held August 18 at the Hebron Country Club in Hebron, Nebraska. With a beautiful day and 76 golfers, the Tournament was a success; raising more than $7,000! Thank you to our sponsors, vendors and everyone that helped make this a success! The Foundation for Blue Valley Lutheran Homes Golf Tournament began in 2004, as a way to raise funds for remodeling and upgrade projects that normal operating expenses do not cover. This year’s funds are earmarked for a handicap accessible golf cart. The golf cart will assist in transporting residents to appointments or shopping in Hebron, provide easy outings for residents to experience the outdoors more and look at local sights. A beautifully sunny day with a nice breeze set the stage for a wonderful day with golfers enjoying the scramble competition, food and beverages, flag prizes, and a great golf experience. Golf teams came from Hebron, Daykin, Ruskin, Bruning, Deshler, Nelson, Davenport, Lincoln, Omaha and surrounding areas to participate in a day of relaxation and golf. The tournament champion this year was the Dave Klauman, Gunner Mumford, Eric Krupicka, and Ryan Butler team with a score of 52. 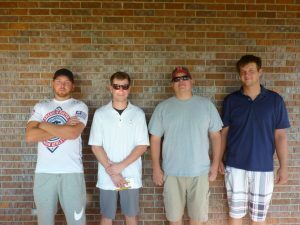 The first flight winners were the Crop Production Services of Chester team with members Jacob Wit, Trevor Wit, Tyler Wit and Adam Tipton with a score of 63. 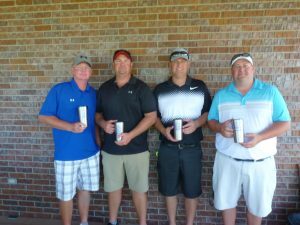 The second flight winner went to The Garbage Company and Norder Supply team with members Conner Hissong, Jake Feulner, Chad Priefert, and Tony Baines with a score of 72. Each flight winner was awarded a commemorative double walled mug. We had wonderful sponsorship of the entire event and appreciate all that sponsored. Additionally the evening was capped off with a wonderful grilled hamburger and polish dog supper that was donated and cooked by NuStar Energy of Geneva, Nebraska. The Foundation for Blue Valley Lutheran Homes would like to thank all of the sponsors, players, volunteers and donors for the tournament this year.